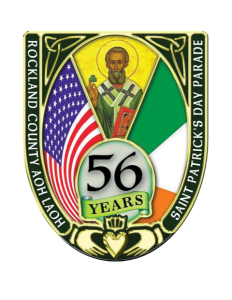 Parade Details The Rockland County Ancient Order of Hibernians St. Patrick’s Parade Pearl River will be taking place in Pearl River on Sunday March 18, 2018 at 1:30 PM Rain or Shine. The parade leaves from the Pfizer parking lot, turning east onto E Crooked Hill Road, turning south onto N. Middletown Rd, turning west onto E Central Ave turning south onto South Main Street, and ending in the area of the Pearl River Post Office. Roads in the Pearl River area are subject to closure up to 1 hour prior to the start of the parade. On street parking is available in the Pearl River area, but please check for any full time or temporary parking restrictions for that roadway prior to leaving your car. Any parked vehicles that are found to impede emergency response or endanger public safety are subject to be ticketed and towed. Please ensure that you park properly and legally. Handicapped parking will be available in the Parking Lot of the Key Bank at 93 N. Middletown Road and the Municipal Parking Lot at the corner of N. William St and E Washington Ave. Please be reminded, The Town of Orangetown Town Code Local Law No. 2 Chapter 10 states: Open bottles or containers in which there is an alcoholic beverage are prohibited by law. Please Note that we have been informed by the Orangetown Police Department that they will be closing the parade route to traffic at Noon. Crooked Hill will be closed at Dove St.. All vehicles must be in place before the closure. If you need to go to the parking lot after 12, you will have to approach from Nanuet. A message from Ancient Order of Hibernian’s Men’s County Board President John McGowan and Ladies’ Ancient Order of Hibernian County Board President Lillian Murphy For the past 56 years, the men and women of the Rockland County Ancient Order of Hibernians have been pleased to host their annual St. Patrick’s Day Parade, an event that has become a Rockland County institution. The parade celebrates our pride in our Irish heritage, and we take equal pride in it also being an event that has brought in spectators from around the world, state, county, etc., and an opportunity to bring families and friends together in a day of wholesome recognition and celebration of the contributions of Irish Americans to our community and country. An event such as the Rockland County St. Patrick’s Day Parade which draws tens of thousands of people would be impossible without the hospitality of the Town of Orangetown, the hamlet of Pearl River and the professionalism of its first responders, particularly the Orangetown Police department, who provide a friendly and safe environment for the day’s proceedings. One of the oldest Irish values is the custom of hospitality and the obligation of courtesy and respect that is incumbent on a guest to their host. In keeping with the spirit of the day and the celebration of our heritage, the Parade Committee asks all participants and spectators to honor this venerable Irish tradition and show the proper courtesy and respect to the businesses of Pearl River and to comply with all directions of the Orangetown Police Department, particularly observing regulations on parking and open containers. The Rockland County Ancient Order of Hibernians ask that all participants remember the true meaning of the day: to celebrate St. Patrick and the generations of Irish Americans who have dedicated and sacrificed themselves for America and not be part of the trivialization of the holiday into the “St. Patty’s Day” image of T-shirt makers and other 21st Century “Know Nothings” whose only respect of “the green” is the “the green of the till”. Keeping the parade the joyous yet dignified and responsible celebration that the day deserves will help ensure that we can keep this great tradition alive for years to come.